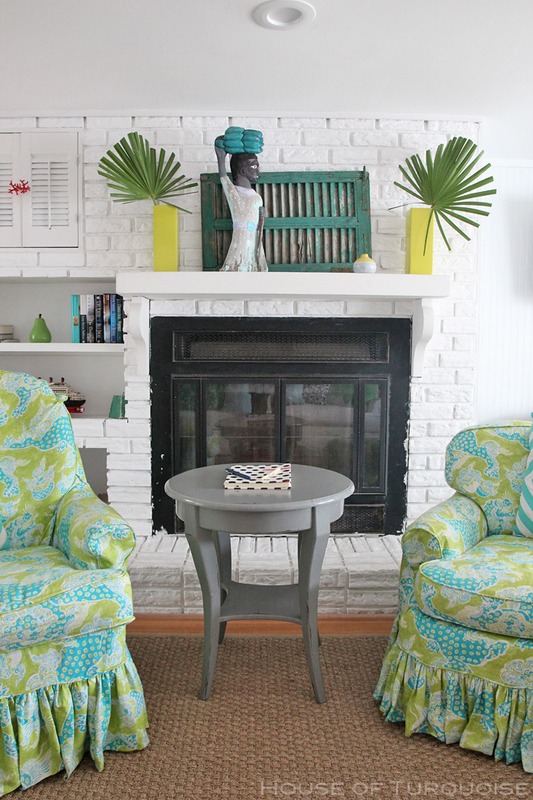 There’s nothing quite like a Jane Coslick cottage to put a smile on your face! 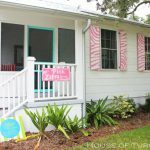 I’m excited to be sharing my photos from our recent vacation at Maddie’s Seaside Cottage on Tybee Island, the laid back little island just outside of Savannah, Georgia. 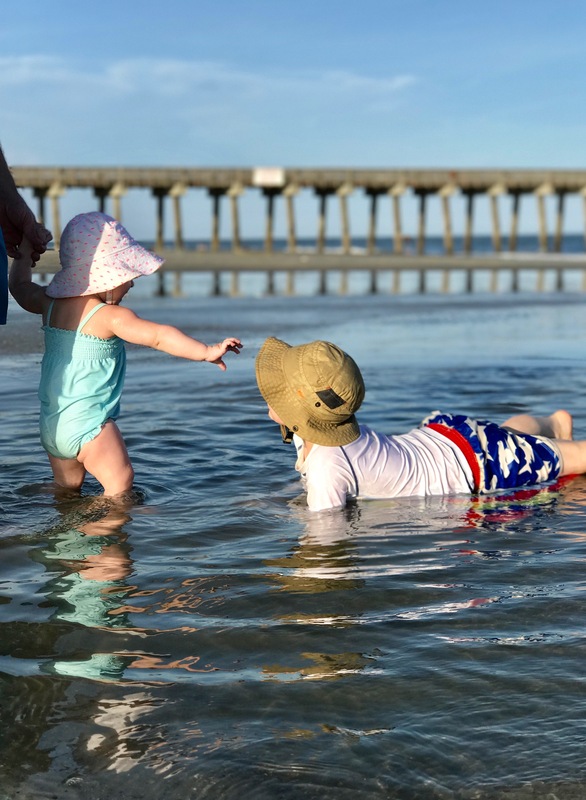 If you’ve been reading my blog for a while, you know Tybee is one of my favorite places to visit. 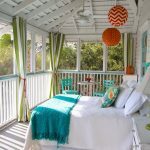 I learned of the island almost ten years ago now after I discovered the work of interior designer and preservationist Jane Coslick; I was immediately drawn to her signature cheery use of color. 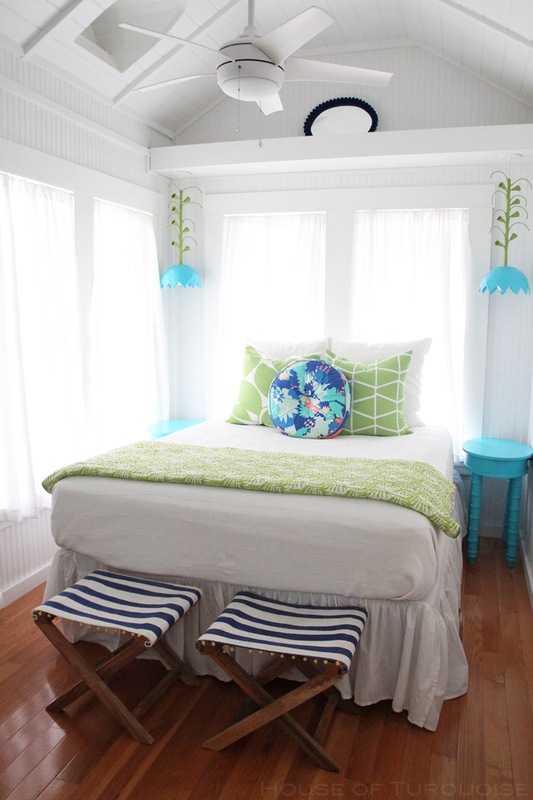 Her beach cottages are my happy place! 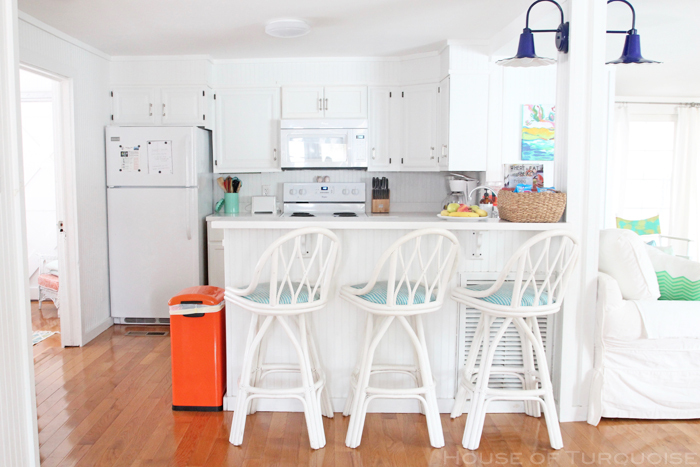 I’m lucky enough to have been inside a handful of Jane’s cottages (I’ll link to them at the bottom) and each time I seriously feel like I’ve walked into an issue of Coastal Living magazine. Picture Perfect. But cozy and comfortable too! 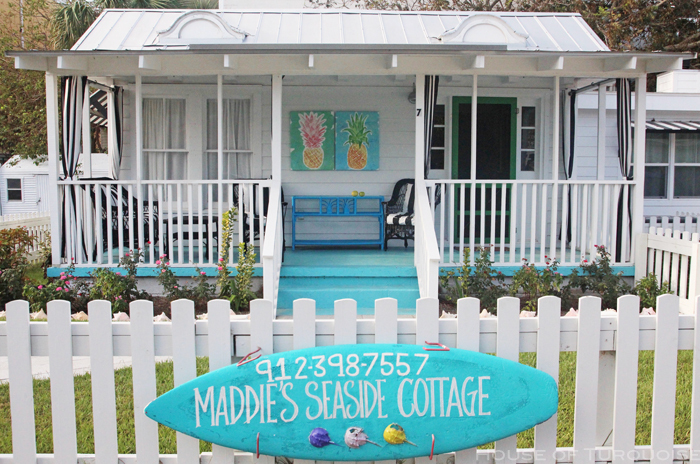 Maddie’s was the ideal beach cottage size…it looked small from the outside, but didn’t feel like it when you were inside. 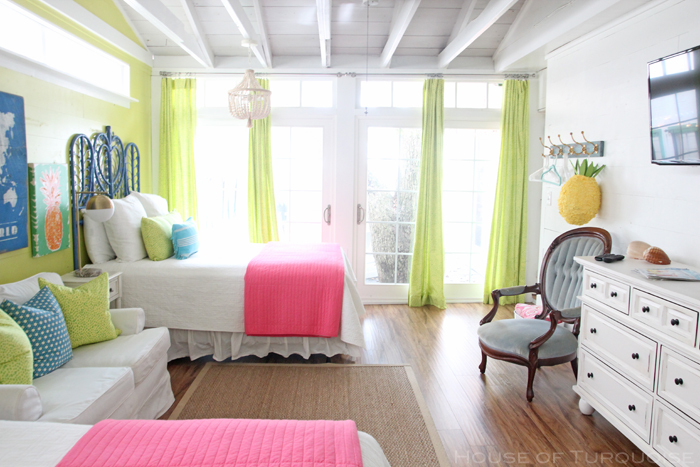 The main living area was bright and open, with two bedrooms, a powder bath and a bunk room right off the kitchen. 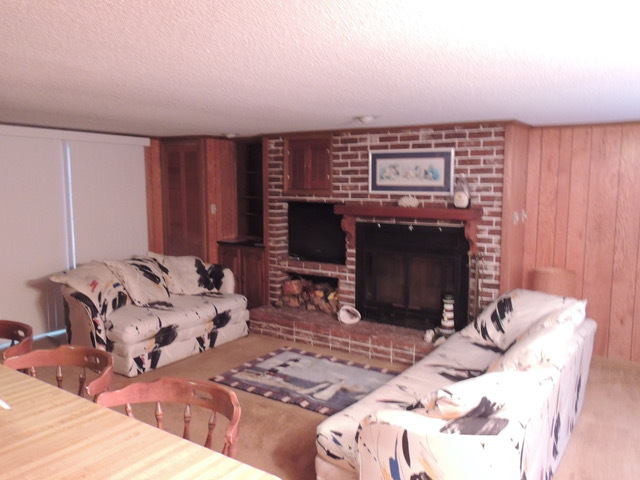 The open living room and dining room is where we spent most of our time. 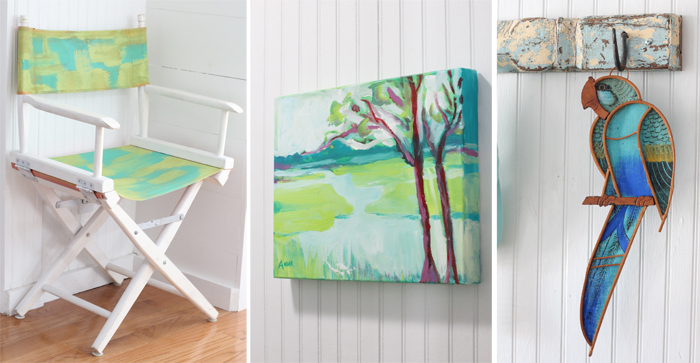 I absolutely loved all of the bold, colorful artwork by Jane’s super-talented assistant Anna, not to mention the the homeowner’s unique finds from her travels around the world. 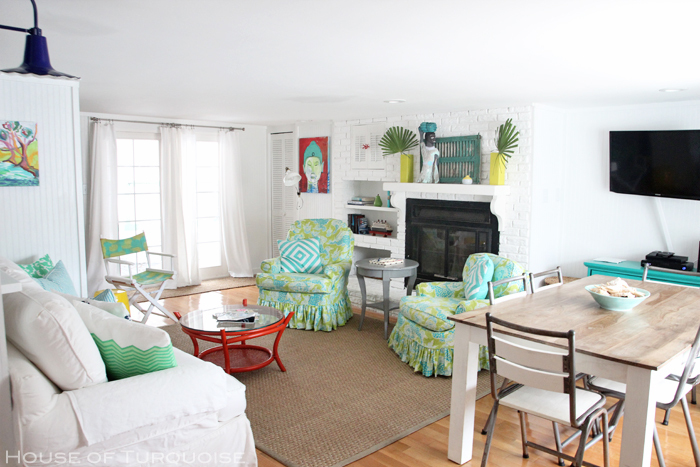 And how about those comfy turquoise and lime green chairs?! 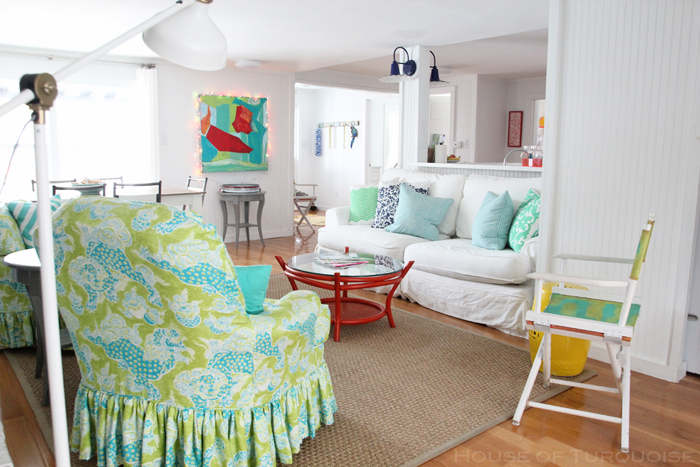 Jane is a genius with slipcovers! 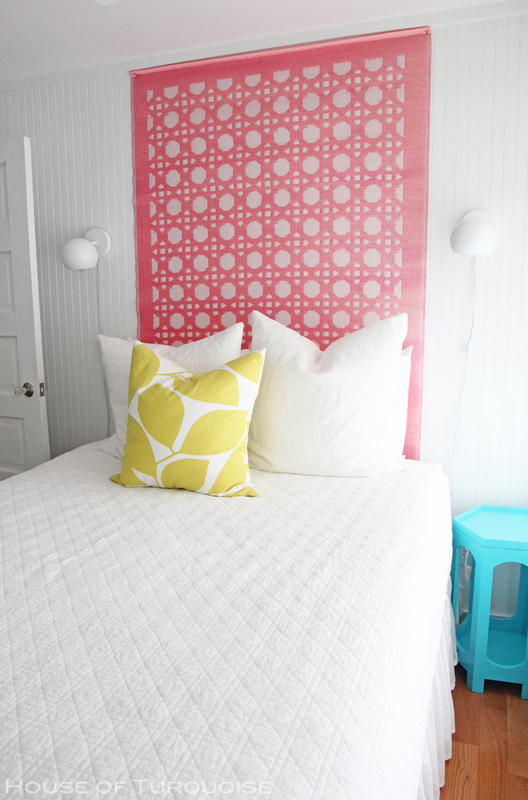 Now on to the bedrooms! 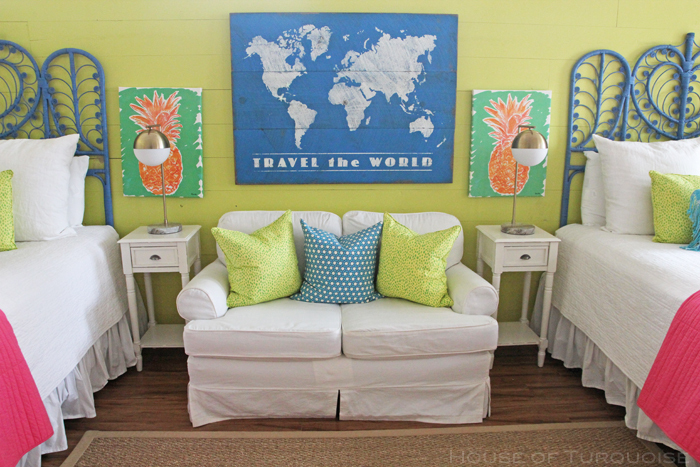 The queen bedroom at the front of the house was filled with so many fun touches. 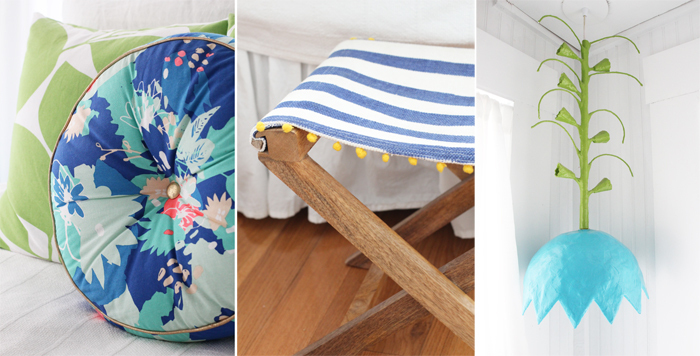 The Stray Dog Designs pendants, cute striped stools, colorful pillows, I loved every inch of that room. 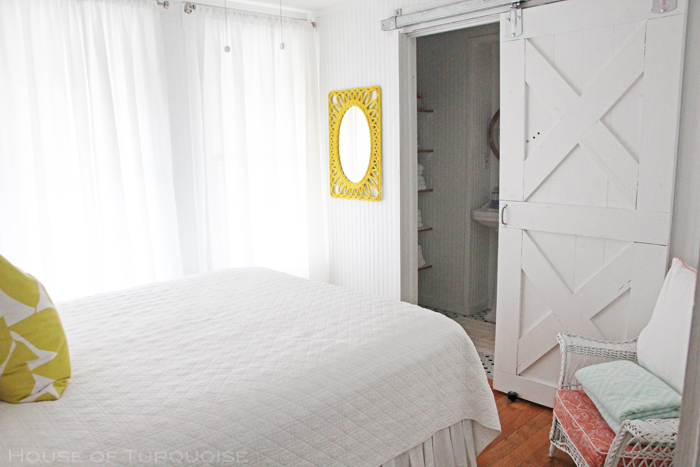 It had a pocket door that opened up to the powder room…loving the mirrors! 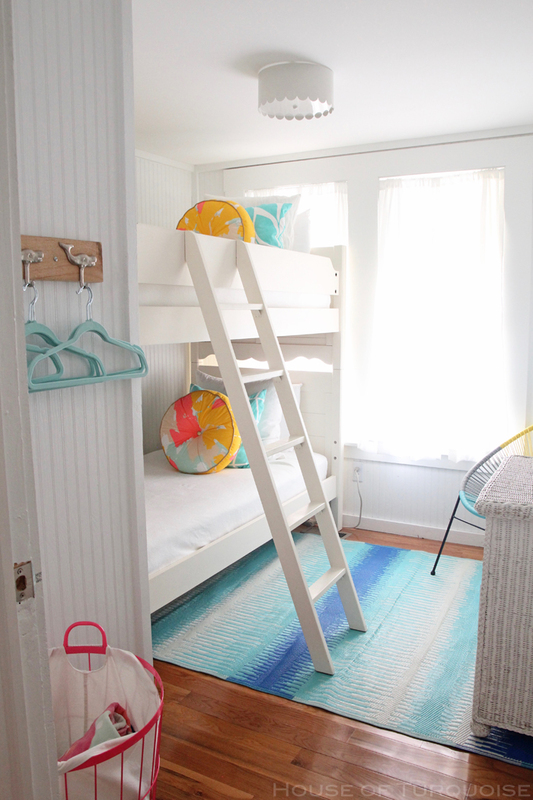 Next we have the kids’ bunk room. You should have seen Wesley’s eyes light up…he was on the top bunk 20 seconds after we walked in! 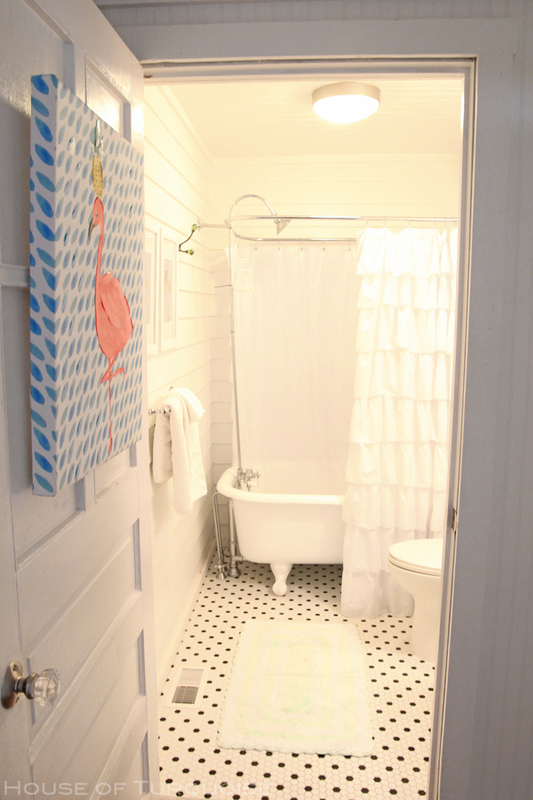 This one had its own private bath with a great barn door and vintage-inspired tile. 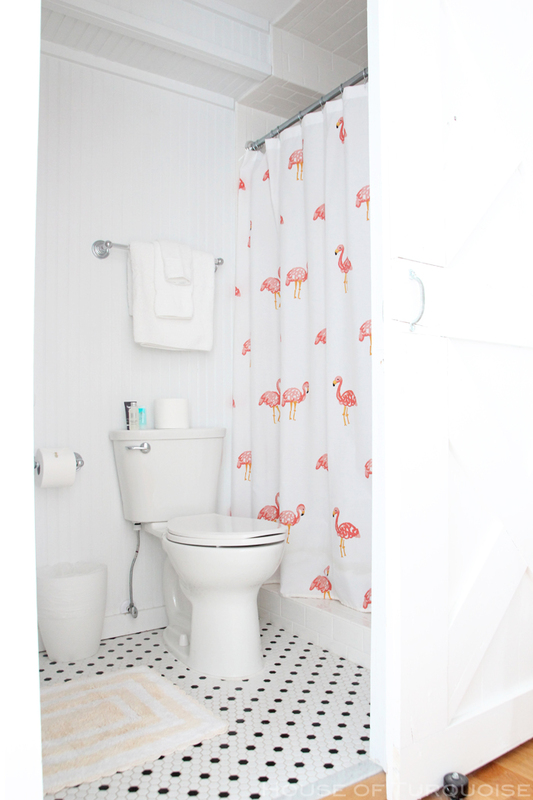 The flamingo shower curtain was so cute! 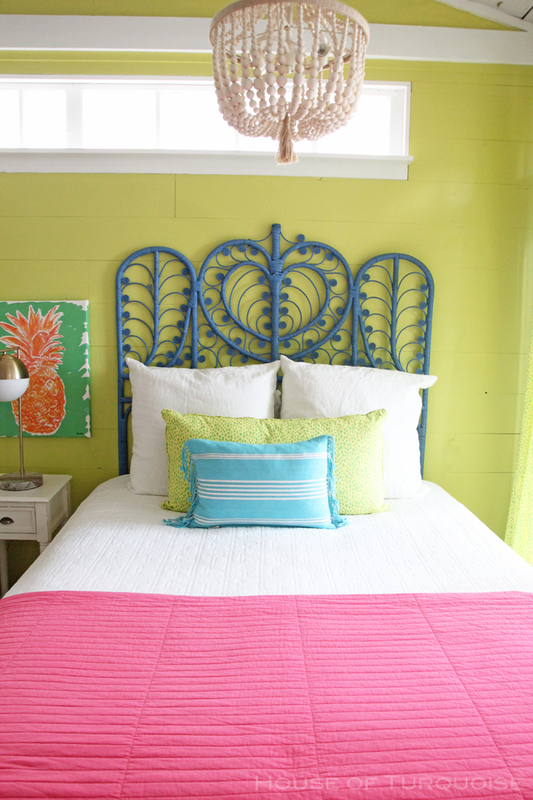 I loved how the colors tied in with the coral headboard…did you notice it’s actually a rug?! Love it! After you turned the corner behind the living room, there was a stacked washer and dryer (SO appreciated having that on vacation!) 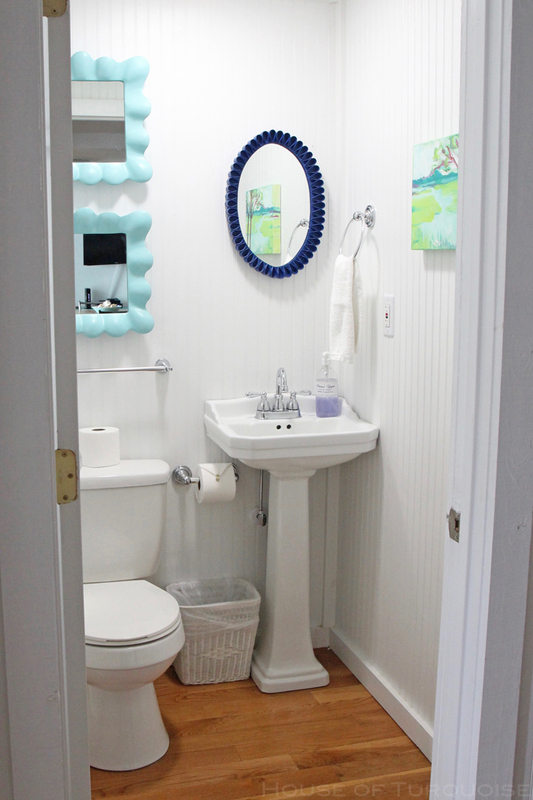 as well as a full bathroom with a clawfoot tub (another thing I appreciated having on vacation!). 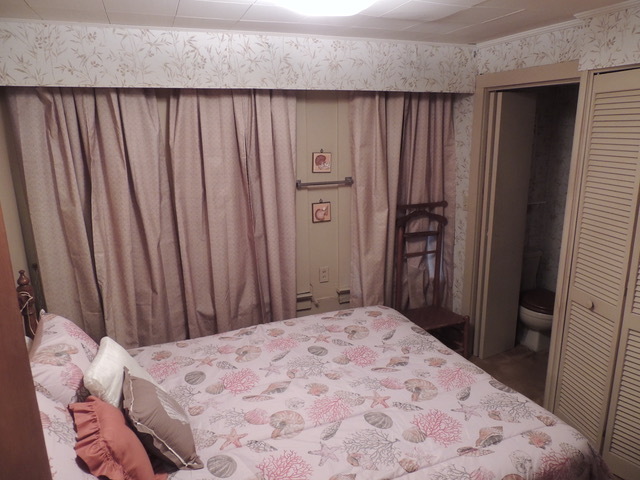 This spacious bedroom/hang-out area actually used to be a porch. 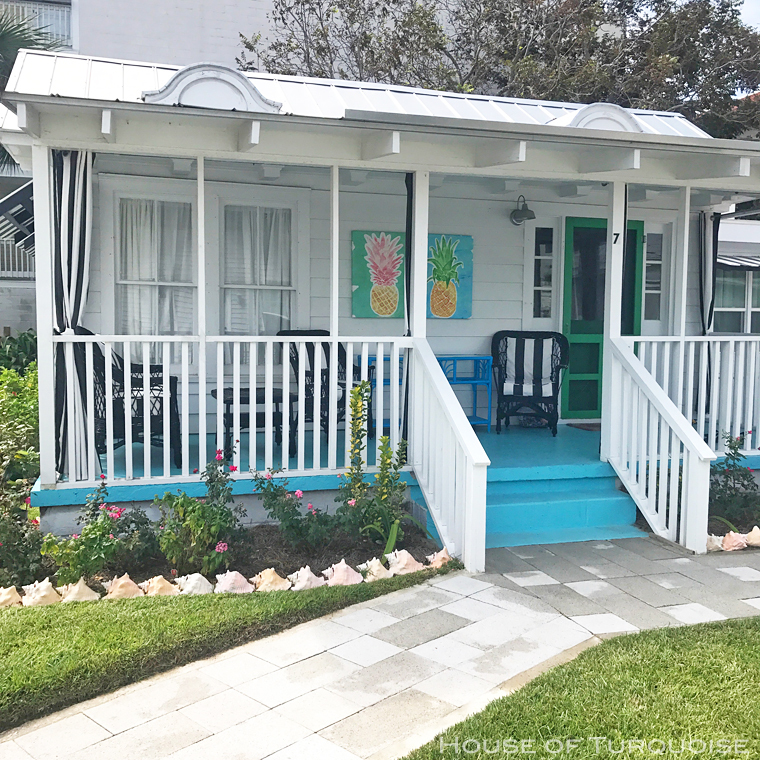 So many great elements in that space like the vintage headboards that came from the attic of Tybee’s TS Chu department store, the beaded chandeliers, original transom windows, and brand new sliding doors that lead to a fun deck and outdoor shower (of course)! 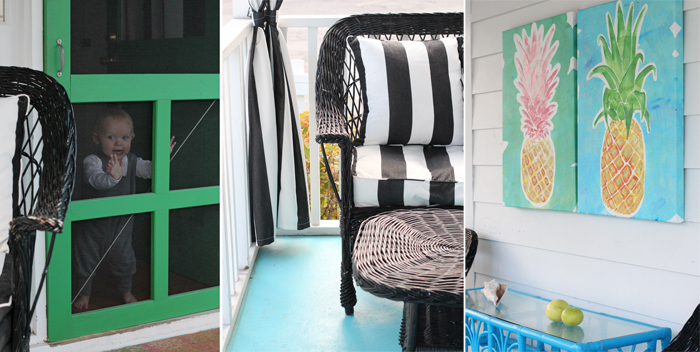 Lastly we have the entry and front porch…bright and cheery with whimsical touches, just like the rest of the home. 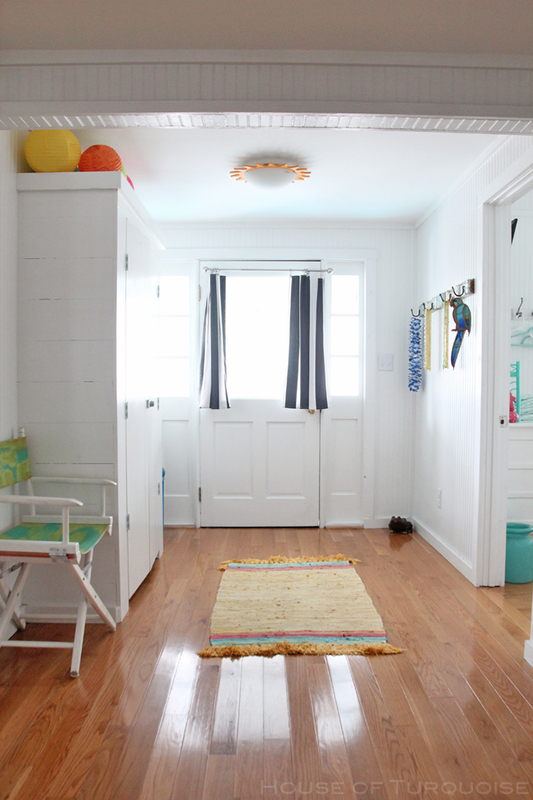 Check out that cute sun light fixture! 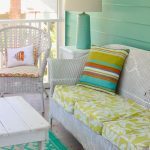 Gotta love that porch floor painted “Tybee Turquoise” from Jane Coslick’s own line of paints! 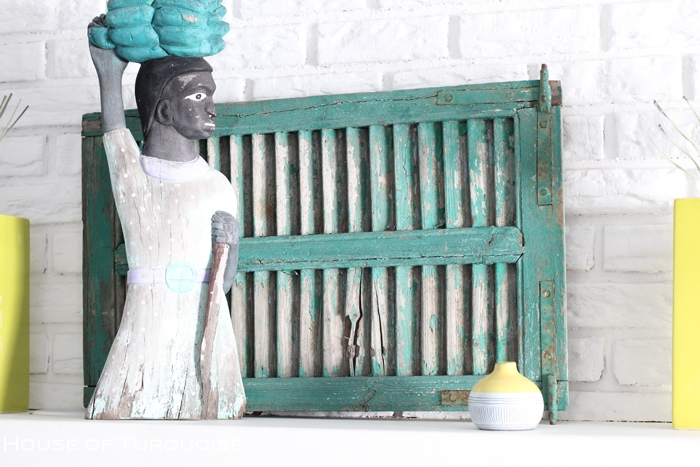 That’s one of the reasons I love Jane’s work and am endlessly inspired by her…she sees the potential in dilapidated beach cottages and turns them into something special. 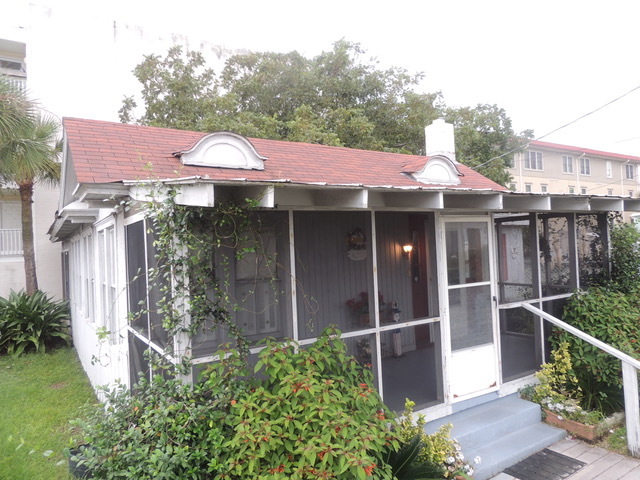 She lovingly preserves the original character and charm, while simultaneously giving the home a whole new look with all the modern amenities. Truly the best of both worlds. 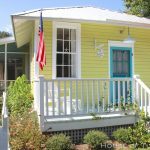 Maddie’s Seaside Cottage is a vacation rental listed through Airbnb…see more photos and get rental info here! 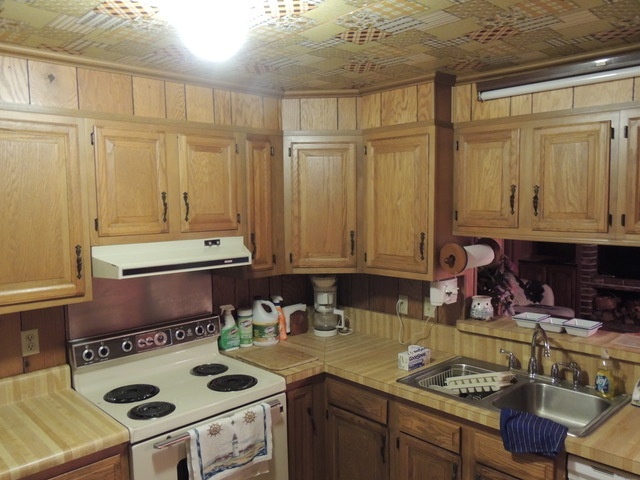 (The homeowners couldn’t be any nicer or more helpful!) 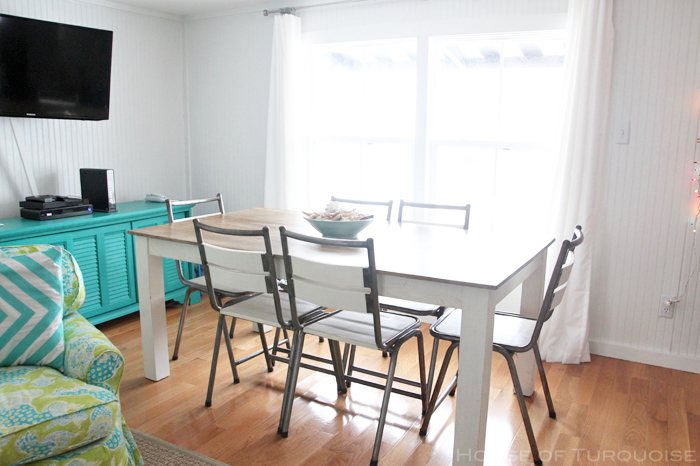 And be sure to check out Jane’s blog for more ‘before’ pics and behind-the-scenes on the design of the home. 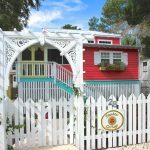 To see more Jane Coslick cottages I’ve stayed at or toured, visit: Mo’s Pink Zebra Cottage, Sundew Cottage, Cottage on the Green, Doc Holiday Cottage, Southern Tides and The Shrimp. 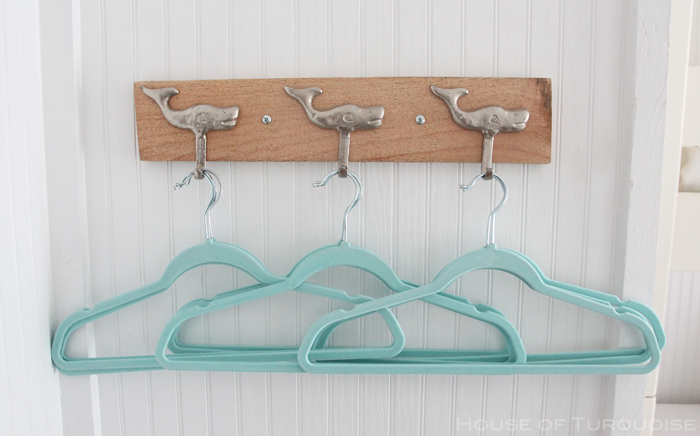 My Turquoise Tour of Tybee is kinda fun too! 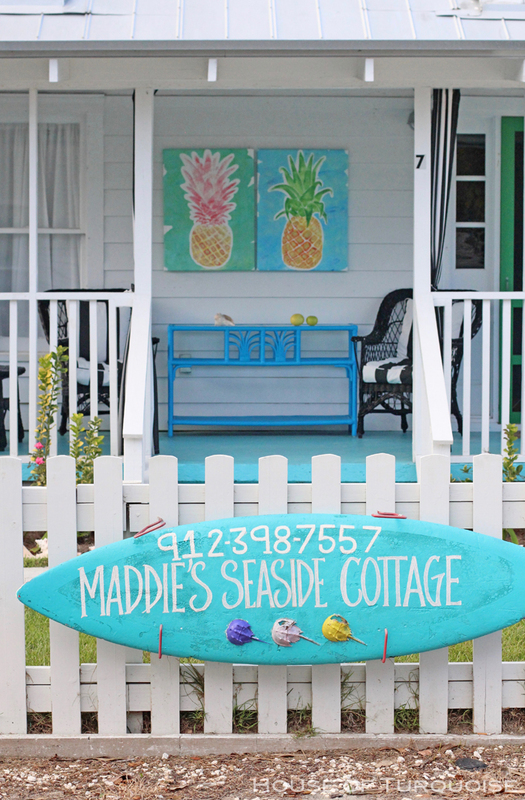 Oh and I didn’t even tell you guys one of the best things about Maddie’s Seaside Cottage–it’s only like a two-minute walk to the beach!! They can’t wait to go back!! 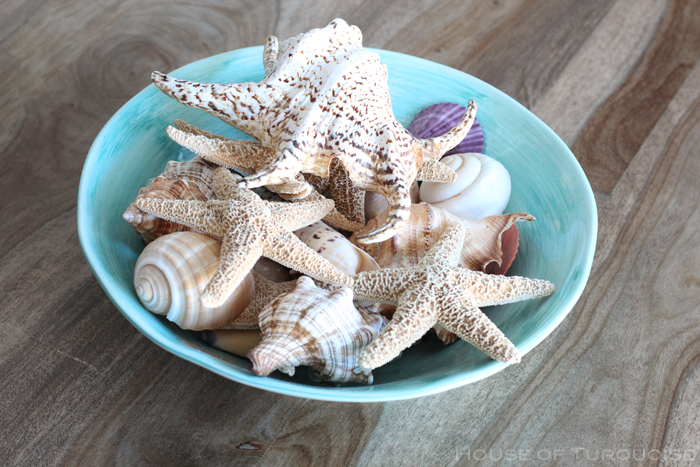 Hi Erin, thank you for sharing pics of your vacation with us! 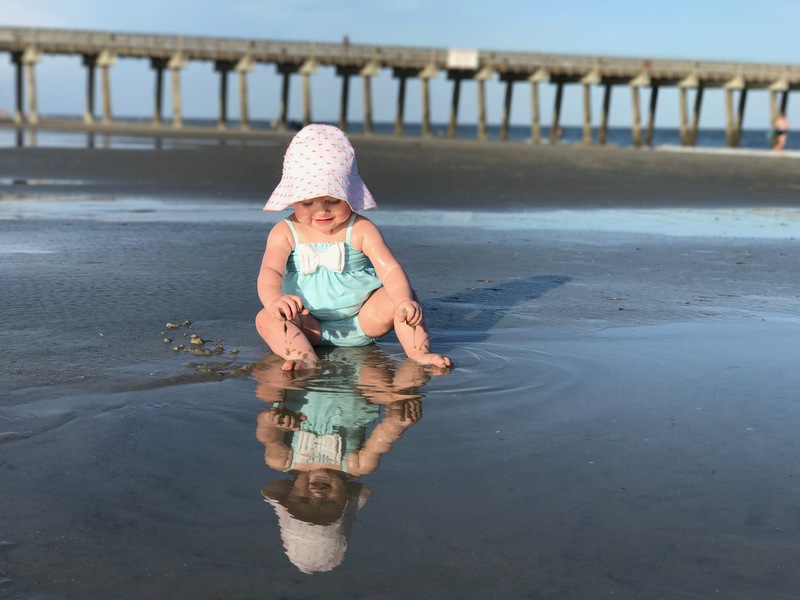 I was seriously worried about how Tybee fared after the recent hurricanes, and in fact I was wondering if it was even still there, or if it had sustained catastrophic damage. Looks like it fared pretty well? At least this house did! Can you elaborate on the condition of the rest of the island after the hurricanes? I’m interested in possibly doing a vacation in early 2018, but thought it might not be possible if there was wide-spread hurricane damage. Your babies are so adorable! What a pair they are, they seem to get their love of the ocean from you! 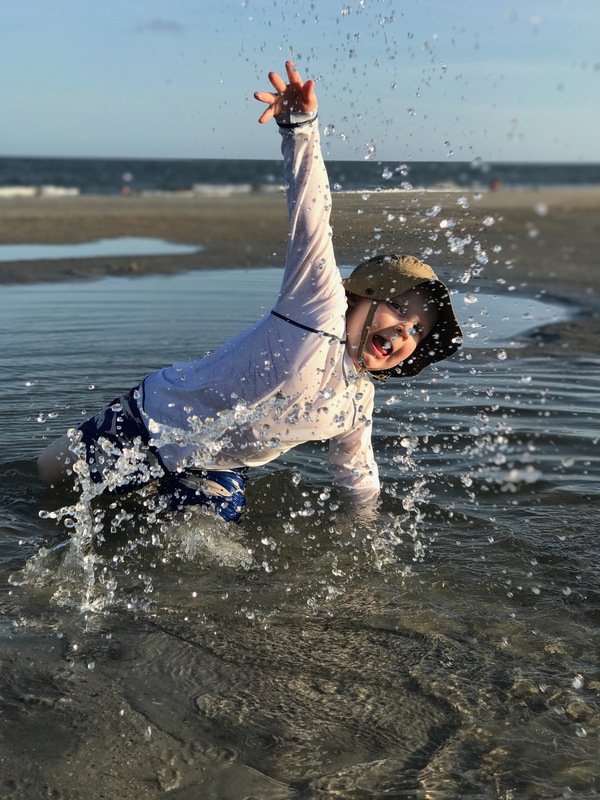 Tybee is looking great, you should go! Sadly a lot of the homes experienced major flooding, which is especially bad considering they had two hurricanes in one year. 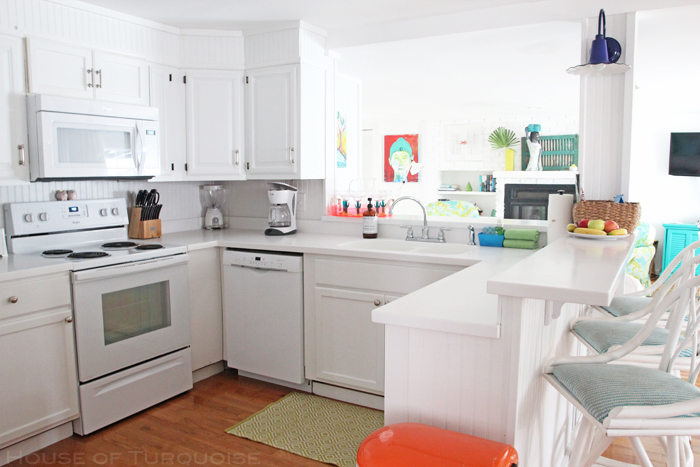 But generally speaking the island looks really good, you’d probably not even notice any damage at all. 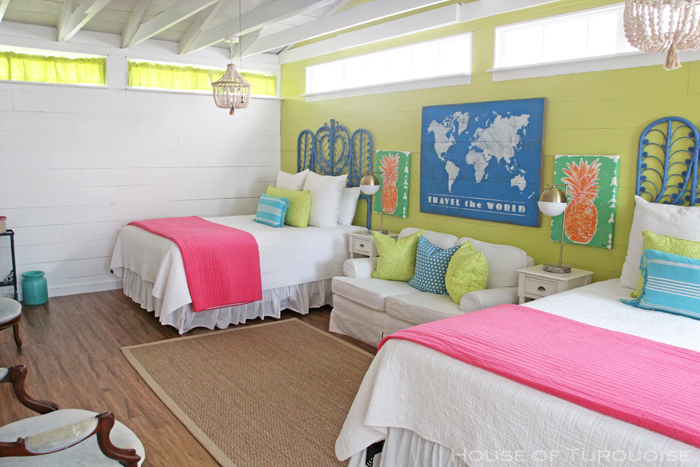 This cottage looks so cozy and adorable! I love it! Thanks for sharing the pics! We are staying there for two weeks next spring!! My family of 6 is beyond excited. 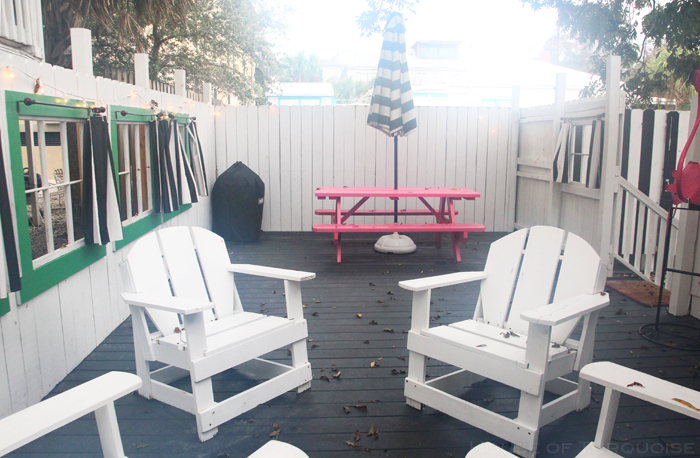 Thanks for the great photos and review of this adorable place!